The 2017 Annual General Meeting will be held on Monday 21 August 2017 in Craignure Village Hall, starting at 1330. Please come along and find out how the hydro has been performing and what the profits have been used for on the islands. 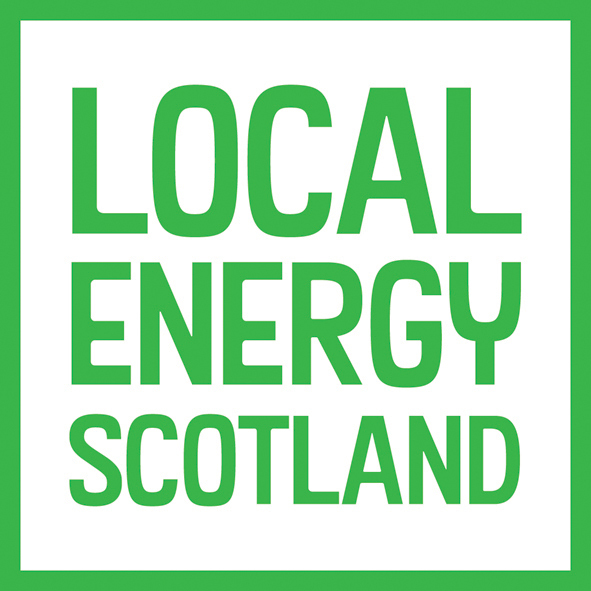 I am pleased to announce the 3rd Annual General Meeting for Green Energy Mull, which will be held at Craignure Village Hall on Monday 15th August commencing at 13:30, doors open at 13:00. This meeting has been called so we can update you on the progress of the hydro, go through the statutory business and to officially launch The Waterfall Fund. 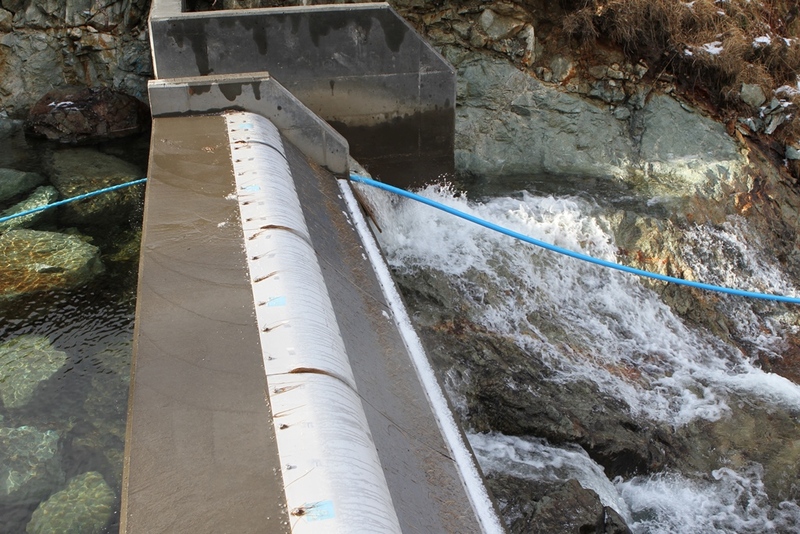 This launch of The Waterfall Fund will celebrate what a success Garmony Hydro has been. 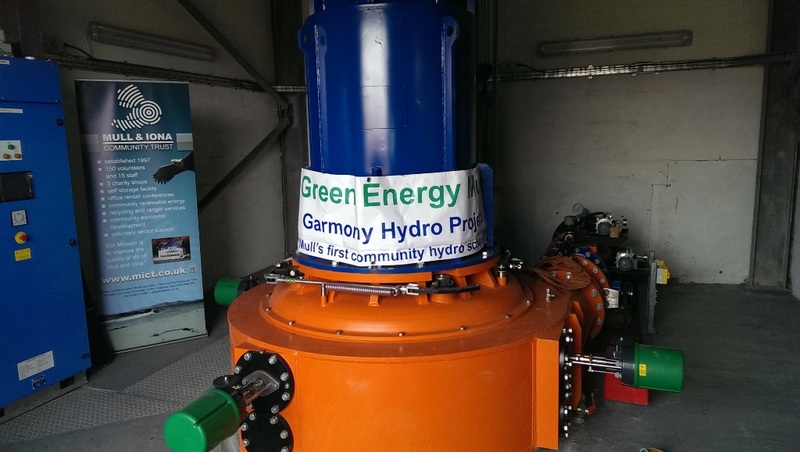 Thanks to all the rain over the last year, Garmony has generated enough electricity, for Green Energy Mull to be able to donate money to the fund. The actual amount will be announced at the meeting, and a cheque handed over to the fund trustees. The meeting has been planned so anyone travelling from off island can take the 12:30 ferry from Oban as a foot passenger and should be able to return on the 17:10 ferry, or as the meeting is on a Monday afternoon, you could come to Mull for the weekend. As part of the company constitution, three currently serving Directors have to step down each year. This year; Andrew Robertson, Colin Pritchard and Chris Baker are stepping down, but all are standing for re-election. However, if you or someone you know who is a shareholder in Green Energy Mull would like to become a Director, please let Richard Thorne (rthorne@mict.co.uk) know. If on the day of the AGM there are more than 9 nominations, then we will hold a show of hands election. 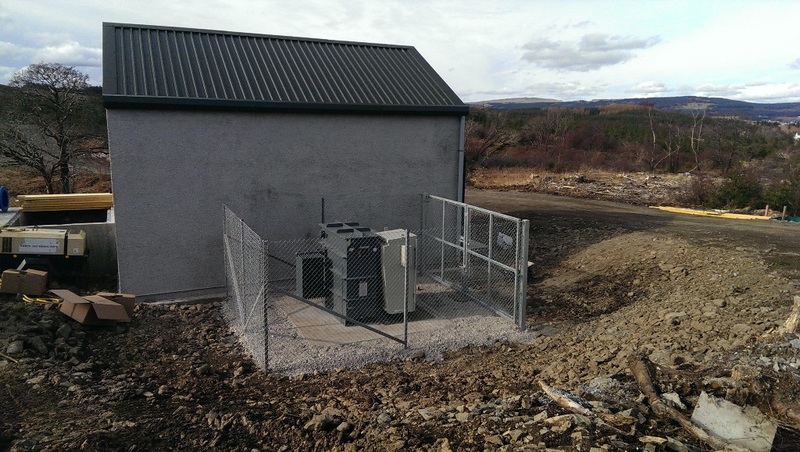 The Annual General Meeting for Green Energy Mull, will be held at Craignure Village Hall on Friday 25th September commencing at 15:45. This meeting has been called so we can update you on the progress of the hydro, go through the statutory business and to visit the scheme if you wish. The meeting has been planned so anyone travelling from off island can take the 14:00 ferry from Oban as a foot passenger and should be able to return on the 19:00 ferry, or as the meeting is on a Friday afternoon, you could come to Mull for the weekend. 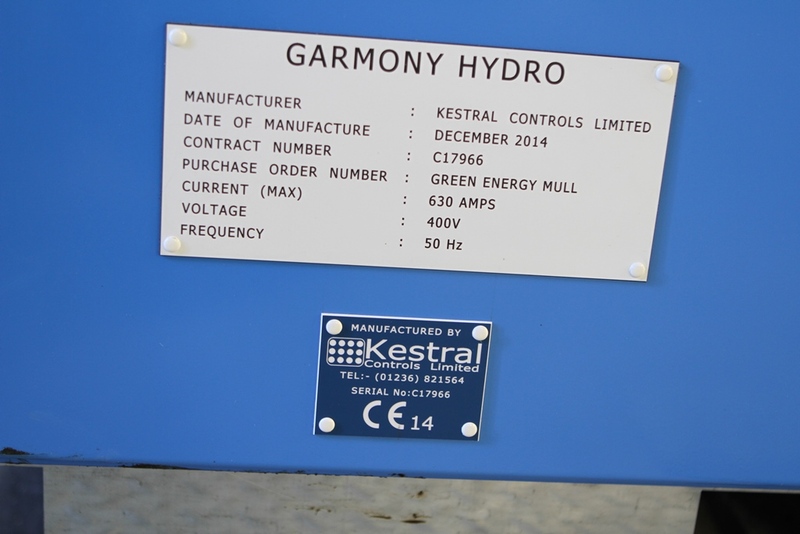 There will also be an update on the Waterfall Fund, this is the charity that will administer and distribute the net profits from Garmony Hydro. There has been a delay in commissioning caused by a fault on the sub sea cable between Oban and Mull. SSE hope to complete the repair of this fault by 13 May and have given us a date of 20 May for connecting Garmony to the National Grid! All our suppliers and contractors are now preparing for this date and we are hoping to have a final G59 certificate on 2 June – which means we can then export power onto the grid and register with Ofgem for full accreditation for our Feed in Tariff. Here are a few photos of the turbine house and also of a visit from Derek Mackay MSP, minister for Transport and the Islands. 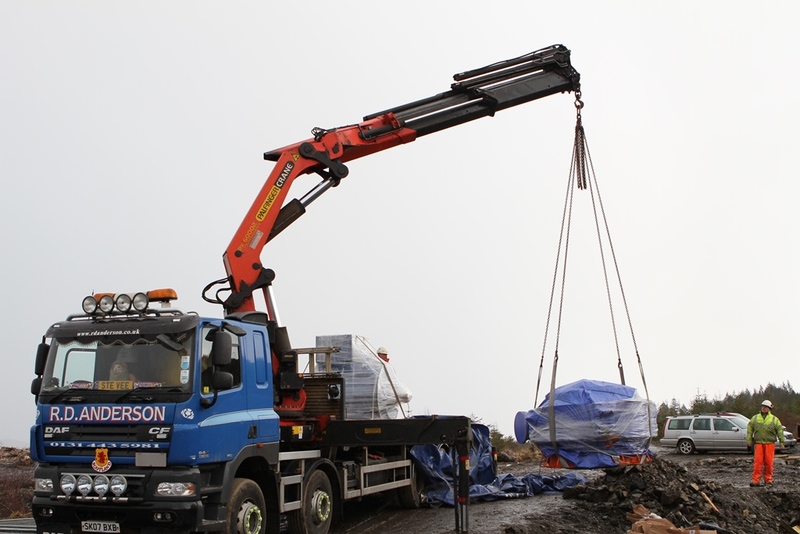 This week saw delivery of the turbine, generator and control panels and despite numerous ferry cancellations, gales, snow and hail showers these have all been offloaded and installed into the Turbine house. The 400kW Tinck Turbine has had a long journey from Slovenia and has been integrated with it’s control panel by Kestral Controls in Glasgow from Glasgow. The grid connection work is well underway by Integrated Utility Services and SSE so we are now hopeful of commissioning the system by the end of March and securing our G90 certificate from SSE early in April to allow us to start export of electricity to the Grid. There has been recent interest in share sales as we approach the completion of the construction work and the current total is £481,150, an amazing result given our initial minimum requirement for £330,000. We have now set a deadline for share sales of Monday 16 March 2015 so if you are still thinking about it please move quickly and submit your application. 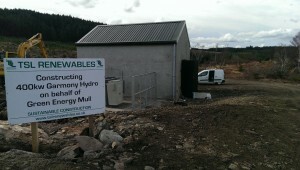 There is still time to become an investor in Green Energy Mull. It is almost a year to the day since we launched the share sale, and since then over 200 people have become investors. As the scheme is progressing well through the construction phase there is still time to become a share holder, but we will have to call a halt to investments soon. We have smashed our initial target of raising £330,000. Our totaliser sits today at over £450,000 which is a staggering amount of money. This is a great scheme and one that will help to improve the lives of islanders for many years to come. As I mentioned at the General Meeting back in August the budget for this project is tight and any additional income that we can raise will mean that we do not have to seek additional loan finance if necessary. 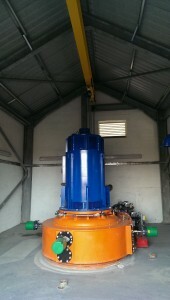 I realise that there are a number of similar community based renewable energy schemes out there seeking investors, but all I can do is ask for your additional support. If you have already invested in GEM, you are more than welcome to invest further. With bank interest rates still so low, this is still a good scheme to be involved with. 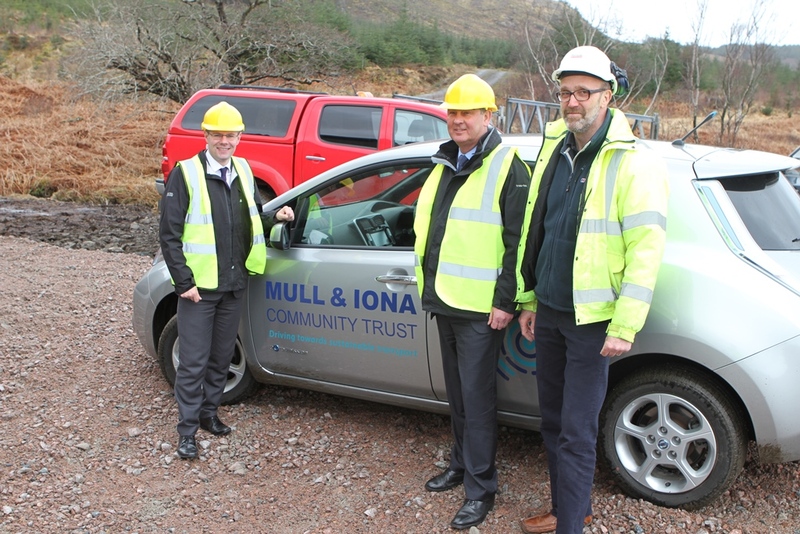 The weather over the last few weeks has been especially wet and it is grand to think that soon we will be able to harness this rain and make some money out of it for the communities of Mull and Iona. 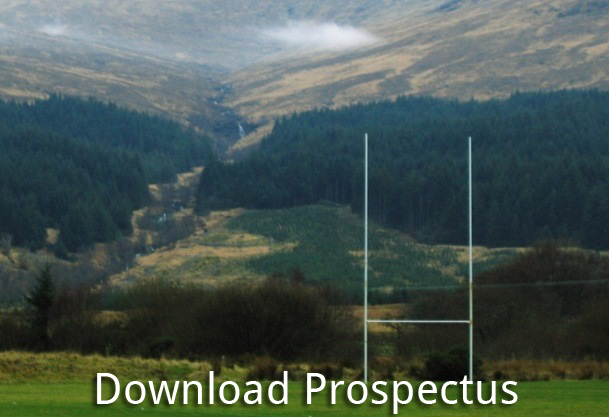 A share Prospectus can be downloaded from this web site, but if you have any specific questions, please let me know. Many apologies for the lack of updates from these pages since the AGM back in August. Nigel Burgess – Vice Chair – Nigel has also been involved with the scheme since its start, and is also Chair of Sustainable Mull and Iona, a group of like minded islanders who promote and encourage the use of sustainable and renewable energy. Richard West – Finance Director – Richard lives in Tobermory and has experience of keeping the finances on track for a number of community and social enterprises on Mull. Chris Baker – Chris was a member of the Garmony Hydro Steering Group and has vast experience of small scale hydro schemes on the island. Andrew Robertson – Andrew has been involved with the hydro scheme since the start, and was also a member of the steering group. Since work commenced on site back in May a huge amount has happened and the scheme is progressing well. 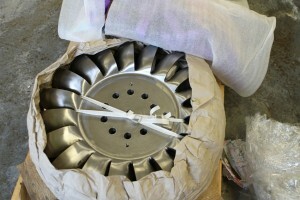 The primary intake is almost complete. This has required much digging and rock breaking and dodging the bad weather. 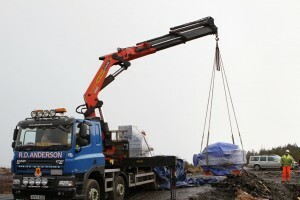 The 800 metre long pipe that will take the water from the intake to the turbine has been delivered, welded together and is now being buried in a trench. Work on the turbine house has now been started and the foundations are being laid. Although all the contractors and suppliers involved with Garmony Hydro are doing their absolute best, there is a chance that the scheme will not be commissioned by the end of this year, but it is hoped that commissioning will take place during January 2015. I will post photos of the scheme as soon as I can. The first meeting for the members of Green Energy Mull will be held at Craignure Village Hall at 15:45 on Friday August 22nd. We are aiming to make this event as informative as possible and to run trips out to the Garmony Hydro site so members can see where their money is going and how the construction is progressing. One of the main purposes of the meeting is to elect the first full board of Directors. These Directors will put the wishes of the membership into action and will guide GEM through at least the next year of its life. There is a new page on this site called General Meeting where Director Nominations are listed. If you would like to vote for a Director, nominate a member who wishes to be a Director or even nominate yourself please check this page and then use the nomination and voting forms that you have been sent along with the invitation to the meeting. Please check this page for updates. 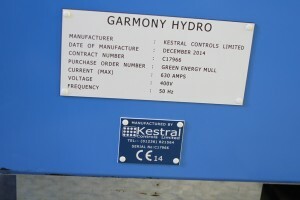 It has come to our attention that one of the candidates for the upcoming election for the councillor for Ward 4, Oban South and the Isles of Argyll and Bute Council has been using Garmony Hydro as part of their election campaign. 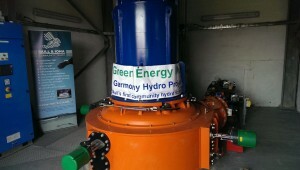 The current founder Directors for Green Energy Mull and the steering group for Garmony Hydro would like to make it known that Green Energy Mull and Garmony Hydro are completely politically impartial and have no affiliation with any political party be it in these elections or any other. We entertained David Miller, the BBC Scotland Environment Corespondent on Wednesday in the sunshine. The piece will be aired tomorrow (Friday) on the radio (Good Morning Scotland), TV (Reporting Scotland) and BBC News Online. The sun shone all day and the burn was running well. David was keen to highlight the economic benefits to the island that the scheme will bring. Thanks to Moray Finch and Jenny McDowall for the help with this.